I control my destiny and my life. Nothing controls me. Ever. Go to school. Get good grades. Stay out of trouble. That's the mission for most kids. But Nick Gautier isn't the average teenager. He's a boy with a destiny not even he fully understands. And his first task is to stay alive. Nick is on the brink of becoming either the greatest hero mankind has ever known . . . or he'll be the one who ends the world. With enemies new and old gathering forces, he will have to call on every part of himself to fight or he'll lose everyone he cares about. Even himself. 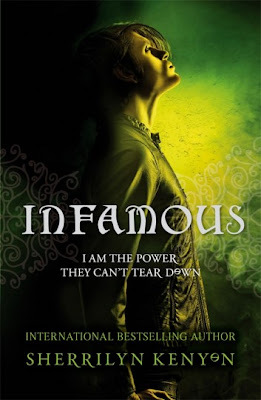 Infamous is the third book in Sherrilyn Kenyon's Chronicles of Nick series so this review may contain spoilers for previous books. I'm going to assume that anyone who reads beyond this point is up to date with the series so look away now if you're not! Nothing is ever easy for Nick, ever since he discovered the truth about his father and the prophecy surrounding his own birth he has been struggling to come to terms with things. He doesn't want to be responsible for the end of the world and although he has been told that he was born evil he wants to believe that he has a choice in the way he behaves. I love Nick and the relationship he has with his mother, they have their arguments sure but they are the centre of each others worlds and have always been there for each other. There are some really sweet scenes between them in this book and also some upsetting ones that give more information about Cherise's past and everything she went through to have Nick. Nick and his mother never really had many people to rely on apart from Mennie who was the only person not to look down on them and who offered unconditional support. What is really nice is that they are now gaining quite a support system and this really shines through after Nick yet again finds himself injured and in hospital. Poor Nick never seems to get through a book without suffering serious harm! I'm really enjoying getting to know the side characters - from the completely crazy Bubba and Mark (and meeting Bubba's mother was fantastic! ), to Kyrian and Acheron, along with Cherise's new colleagues - they all have something to bring to the story and are far from one dimensional. Of course we can't forget Nick's protectors - the demon Caleb and the mysterious Kody who is keeping more than a few secrets from him. Infamous will answer some of the questions that were raised in previous books but it will also leave you with plenty of new ones. Fans of the series will love this latest instalment and I can't wait to get my hands on Inferno to find out what happens next! I adore Sherriyln Kenyon. She is one of my favorite authors! I haven't picked up the Chronicles of Nick series yet though. I'm really loving the paperback covers over the hardback!